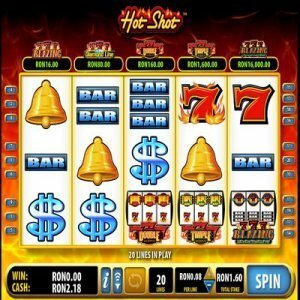 [mrgreen]Developed by Bally Technologies and released on the Microgaming platform, which is world renowned for its impressive lineup of slot machines, Hot Shot slots is an entertaining online video slots game that has been turning heads for quite a while. Part of what draws people in to play Hot Shots is that it’s one of Microgaming’s progressive machines, which means the jackpot could literally rise into the millions of dollars before someone finally hits it. It’s that type of draw that keeps players from all around the globe coming back time and again to play this particular game. All in all, Hot Shot isn’t exactly a record-setting or breaking slot machine. It’s fairly innocuous in the way it’s set up; it’s a basic 5-reel slot machine with only 9 paylines. But it’s also very attractive and very smooth. It has earned huge praise for being able to run rather well on mobile applications. With more and more people giving up their desktops and laptops in favor of smartphones and tablets, having a game that runs well on mobile applications makes a world of difference. The colors and theme also pop with Hot Shot. At first glance, the baseball theme of this game really stands out. Some of the symbols include stadium hotdogs, baseball hats, batters in various stages of swing, a trophy (Scatter), a wild ball symbol, balloons, and more. Another cool aspect of Hot Shot is its audio effects. While playing, you might hear the roar of the crowd and the crack of the bat. Along with the look of the screen, it does a pretty good job at creating an overall stadium ambiance that makes you feel like you’re outside watching your favorite team duke it out with a rival. If you manage to spin and leave yourself with a gap between a winning combo, don’t worry; the flaming wild ball might just come in and fill it up, creating a winning combination after all. Apart from the scatter symbol, the wild ball will take the place of all other symbols. You don’t have to worry about educating yourself in slot betting etiquette before playing Hot Shot. Since it’s a Microgaming release, everything is fairly straightforward in terms of how the bets operate. You’re able to select from a betting range between 0.25 and $18, and various coin values from 0.25 up to 2, which equates to 18 total on all 9 paylines. This is basically a midrange game. It isn’t the best option for penny slot players, nor can you bet hundreds at a go if you’re a high-roller. Though if your tastes lay somewhere in the middle, this might be the game for you. Between the initial graphics, the soundtrack and the overall feel of the game, Hot Shot does a great job at actually driving a whimsical theme home. They don’t simply put a ball and bat out there and expect your imagination to do the rest. In terms of bonuses and such, there aren’t any extra levels to the game, which is a real downer, but there are still many different ways to win.